Foggy morning, golden but faint daylight, rustles of fallen leaves and the smell of candied apples. Yes, it’s Autumn that makes you want to snuggle under a blanket with good books. This month, as Halloween is coming up, I will share a picture book a bit dark and full of mystery and suspense, if not horror. 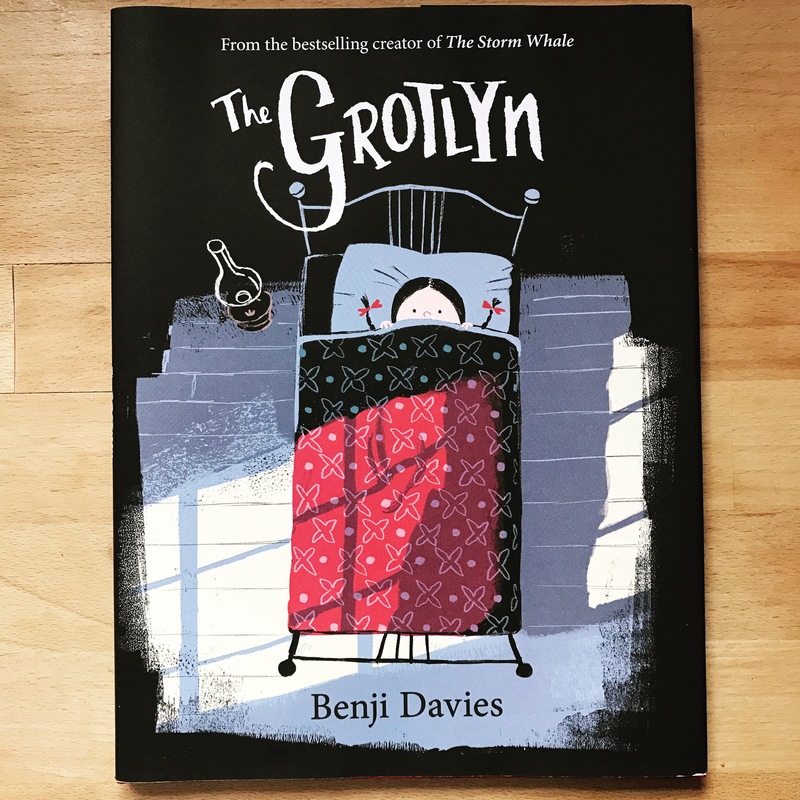 It’s A beautifully illustrated rhyming tale, The Grotlyn by Benji Davies (Harper Collins 2017). Don’t worry. No spoiler, I promise! Ever since little Rubi heard about this mysterious Grotlyn, she can’t keep it out of her head. Then strange things begin to happening at night. Random things – a lump of cheese, cotton spools and even PC Vickers’ knickers – go missing and you can feel the invisible presence of Grotlyn. Soon the Grotlyn becomes THE talk of the town. What is Grotlyn? What it’s up to?? The award-winning author/illustrator Benji Davies is probably best known for Grandad’s Island and The Storme Whale. But I must say The Grotlyn is my favourite so far. First, it’s because I’m a big fan of mystery detective stories, growing up reading Poirot and Miss Marple’s ‘whodunnit’ adventures. Second, the colour palette of this book is darker but more sophisticated (mostly black, grey blue and scarlet) than his other books and I love it. Third, the rhyme is beautiful and complements the atmospheric gothic Victorian setting. Forth, Benji’s animation background is evident in those stunning cinematic compositions, which I really like (shame I can’t show you my favourite spread as it’ll be a massive spoiler!). Finally, the story has an unexpected and clever ending.